Alumna Laurie R. King is a New York Times bestselling author of 25 novels and other works. 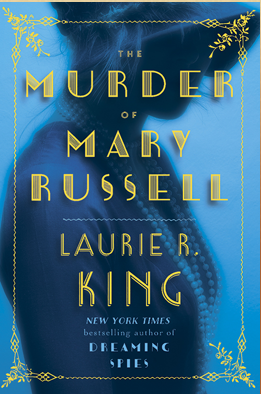 King's new book, titled The Murder of Mary Russell, comes out April 5. A few years ago, author Laurie R. King went to the walled Moroccan city of Fez, intending to have a lovely vacation with her daughter and son-in-law. Instead, as she wandered the ancient city’s narrow and twisting streets, she began to think about one of writing’s popular plots: that of a character who suffers from amnesia. Wouldn’t this maze of streets be the perfect setting for a person trying to sort out their past, she thought? Wasn’t it also perfect that Fez was in the midst of a civil war in 1924—the year that is the setting for many of her bestselling mystery novels featuring her intrepid character Mary Russell, the much younger wife and intellectual peer of the legendary Sherlock Holmes? “I had a plot laid right out for me,” she says. For the award-winning King (Kresge ’77, religious studies) no experience, no interest, no encounter is without the potential to spark the next of her 25 books, some 3 million of which have arrived in the hands of eager readers over the past years. 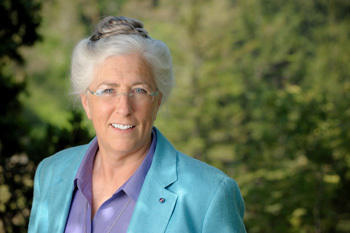 An interest in India, the birthplace of her late husband, UC Santa Cruz Emeritus Professor Noel King, set off the 2004 book The Game, while an independent study course on alchemy during her time at UC Santa Cruz was the genesis for her 1999 novel A Darker Place. Her senior thesis on the role of the fool in Western culture, meanwhile, showed up in three of her novels: To Play the Fool (1995), God of the Hive (2010), and Dreaming Spies (2015). “I’m probably one of the few people who actually make a living on a religious studies degree, who didn’t go into the ministry,” she says with twinkle in her eye. King, who is a third-generation San Francisco native and earned an honorary doctorate and a master's in Old Testament theology from the Graduate Theological Union, began her writing life at the age of 35. She’d finished her graduate work, her young son had started preschool, and being a professor’s wife with summer travel precluded a regular job, so she turned to what she loved: fiction. Her first two novels featuring her now-legendary protagonist Mary Russell did not immediately sell. However, her third novel, A Grave Talent, which was set in San Francisco and centered on a lesbian detective named Kate Martinelli, not only earned her a publishing contract but also an Edgar Award for Best First Mystery Novel. Sitting at an outside table at a coffee shop near her Santa Cruz home, King is open, personable, and quick with a laugh as she talks about her writing life, her family, and her time at UC Santa Cruz. She’s not fussy about where she writes, she says. A laptop and a chair will do. And, while her character, Mary Russell, might resemble her in appearance, “Russell is far more competent that I am. I can’t even throw a knife,” she says. She writes a book a year. She lives with her sister and brother-in-law. Her daughter Zoë Elkaim (married to UC Santa Cruz Professor of Engineering Gabriel Elkaim) is her literary agent, and while she was a “hippie in the hippie world up there,” UC Santa Cruz was a time of satisfying inquiry for her. Writing, she says, comes easily for someone who spent years penning papers in graduate school and the fact she’s written so many books with different characters and locales means she has never been bored with her profession. She admits, however, to having a discussion last year with her longtime editor, Kate Miciak at Bantam Dell Books, who asked King if she’d ever consider killing off Mary Russell. “Obviously, someone who makes her living off writing isn’t eager to kill off her main character,” she says. “On the other hand, there are some interesting things you could do. …” She lets her voice trail off. Her new book, which comes out April 5, is titled The Murder of Mary Russell, and would seem to indicate that, perhaps, King took her editor seriously. But when a visitor asks King if Russell is no longer among the literary living, she draws an imaginary zipper across her lips. And while she jokes that she is driven to write “by bills,” she later admits that it is her love of storytelling that pushes her creativity. Laurie King will be at Bookshop Santa Cruz at 7 p.m. April 20 to discuss and read from her newest book, The Murder of Mary Russell.